Hey! That’s a special scarf designed by Howard Hughes! Do you know what the Nazis would do to get their hands on that? Go Rocketeer, It’s a great movie but it’s often overlooked. Overall, a great job. I loved the movie it was really great. I love the images it is great. Don’t remember the scarf though. 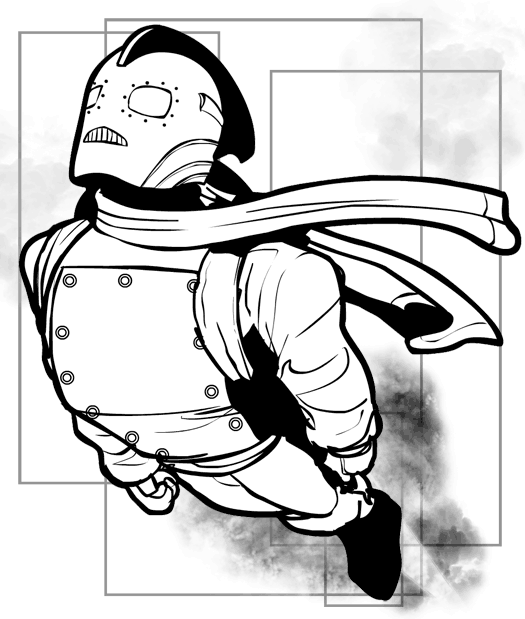 Rocketeer! Yay! I love me some steampunk! I liked The Rocketeer too–stylishly done period piece, good ol’ fashioned adventure romp. Lotsa fun. Got me interested in the music of the ’30s and ’40s. It seems that I am the only one who hasn’t seen this movie. But it is a fun, creative drawing. To me it looks like a Nazi robot with a mohawk-mullet mixture, but hey, it catches the eye, and it fits. Cool one, Jeff.